Take lift to the top, then turn left, turn right to the bottom. Rinse and repeat. It COULD be argued that all skiing is pretty much the same, but it would be wrong, wrong, wrong. Apart from the sky above and the mountain below, there are huge differences in ski areas, not just across the world but right here in the US of A. Some are exotic; some downright quirky. Here are five wonderfully strange places to ski in the US. We begin our tour on Idaho’s innocuously named Silver Mountain. The resort was initially dubbed with one of the best names in skidom, Jackass Ski Bowl. That proved too much fun, so they changed it to Silverhorn, which got shortened to Silver. By whatever name, when you ski Silver, you’re skiing on top of 150 miles of tunnels and a working lead mine. You’re skiing through silver- and gold- and other-mining country. You’re skiing the former whorehouse capital of the Northwest. You’re also skiing sweet snow, wide-open slopes and some of the least-crowded terrain in the country. Silver’s also a bargain—just over a third of the price of better-known resorts. Want to ski two states and two time-zones at the same time? Head to Lookout Pass, which sits right on the border between Idaho and Montana. With their Famous Free Ski School, you’ll feel in a completely different time zone altogether. Ever since Lookout opened in 1936, they have offered free lessons (Yes, free as in ‘no charge’). In 77 seasons, the Lookout Pass Free Ski School has introduced about 75,000 kids to the sport. Let’s head east to the mines of West Virginia and Snowshoe Mountain. On the long drive from Charleston, West Virginia, you’ll pass rusting coalmine collieries, lonely gas derricks and a sign that says “Jailbirds Welcome.” You’ll pass barns with “Mail Pouch Tobacco” painted on their weathered sides, and whitetail deer grazing at a bank’s drive-in window. When you get to the resort, there’s more that’s exotic and unfamiliar. I spent the first morning at Snowshoe trying to figure out what the “train park” was, and why Aspen didn’t have one. When somebody finally pointed to a slope filled with rails, hits and a halfpipe, I had my Aha! moment. “Train park” is what the rest of the ski world calls terrain park. They were crazy when they opened the area in 1948 (because, in 1948, they thought Stowe was way too commercial); crazy in 1995, when they turned Mad River into a co-op; and crazy to this day. Mad River Glen is one of two ski areas in the US to use a single chairlift (a chairlift that seats one person at a time). When it finally wore out, the members voted overwhelmingly to replace it with — Anyone? Anyone? — yes, with a brand new single chairlift. The resort also has a no-snowboard policy. How did they become a snowboard-free mountain? Betsy Pratt, the pre co-op owner, sees a guy trudging through the parking lot, snowboard in hand. Guy goes home. Guy’s Howard Dean, governor of Vermont. Pajarito is home hill of Los Alamos. Los Alamos is the home of “The Lab,” a.k.a. the Los Alamos National Laboratory. The Lab, in turn, is home of the atomic bomb, top-secret weapons research and the world’s most advanced plutonium factory. Not so long ago, Parjarito was largely unknown even to most New Mexicans because of the secrecy surrounding Atomic City. Pajarito didn’t report snow conditions on the radio; it didn’t even show up on the state map. By accident or design, locals send carloads of lost skiers in the wrong direction. Even when they find the right direction, they could easily miss the tiny sign for Pajarito. Pajarito is owned and operated by the Los Alamos Ski Club, whose board of directors is largely composed of nuclear scientists and engineers. 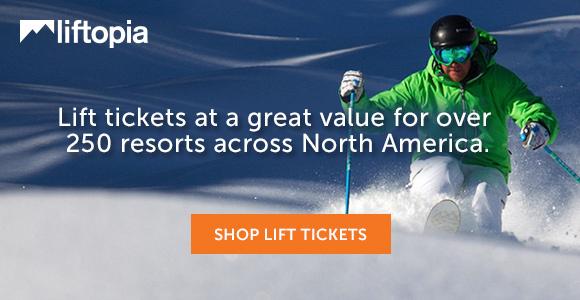 See New Mexico lift tickets. So there you have it. Exotic skiing without leaving the country. Those are my picks — how about yours? Been to all five over the past 44 years,,,,,,,,,,,part of the grand total of 1241 different ski areas in 30 countries. In North America that includes 30 states and 7 provinces.